Or, my working out a sermon based on this Sunday’s Lectionary readings: Philippians 3:4b-14 and Matthew 21:33-46. I want to live a life which God would describe as fruitful; to be part of a community whose corporate life God would describe as fruitful. But I’m not sure that is my experience at the moment. Jesus says that the end of fruitlessness is destruction, but that fruitfulness itself requires a painful breaking process (Matthew 21:43, 44). Paul describes for us the process that leads to fruitfulness. First he lists those things which God has given him, as pure gift, unearned, undeserved, simply out of unconditional love. Until we discover that God loves us unconditionally, we will always try to earn his love, and while we strive for that we cannot be fruitful. We will be hard on ourselves, and even harder on others, for neither we nor they can match the standards we set. Even if we ‘know’ God loves us unconditionally, we forget; we don’t experience his love. Do I know that God loves me unconditionally? What evidence can I cite when I am tempted to forget? In what ways do I see the fruit of knowing that God loves me unconditionally in how I relate to others [this fruit is the first-fruits of a fruitful harvest]? Scottish rugby international, Olympic gold-medal winner and missionary to China, Eric Liddell is attributed with saying, “When I run, I feel God’s pleasure.” Note: when I run, not, when I win. When, and under what circumstances, did I last feel God’s pleasure? Next Paul adds to the list those things he has achieved. We are created not only to know God’s love, but to do things through which God is glorified. We will not be fruitful until we discover and own the things God has created us for. And here, as the saying goes, comparison is the thief of joy. Eighteenth-century Rabbi Zusja is attributed with saying, ‘In the world to come I shall not be asked, “Why were you not Moses?” I shall be asked, “Why were you not Zusja?”’ In the world to come, I shall not be asked why I was not St Paul, but why I was not me: why I shrank back from all that God created me to be and to do. From a worldly perspective, success is what makes you fruitful: the more successful you are, the more fruitful you are. This is the view shared by those evildoers Paul is warning the church in Philippi against. Owning our success is a necessary stage in the process of fruitfulness – there is nothing godly about false modesty, which merely seeks to cover our shrinking-back – but Paul will take us further. Why am I not me? Do I play the comparison game? What success have I experienced; have we experienced? Can we name it and give thanks for it? Paul encounters Jesus, and as a consequence he loses his community, his standing within that community. But as he reflects on meeting Jesus, his perspective shifts from an earthly one to a heavenly one. He does not say, as prudish English translations suggest, that what went before was rubbish: he does not say, in effect, “I can’t believe that I wasted so many years in those ways!” Paul says, I consider those things – the unearned gifts of God, the achievement he has experienced – as excrement. We need to ask, what is excrement? Excrement is the end of good, nutritious food. Paul says, these are the ways in which God has nurtured and nourished me – but they were never an end in themselves. They are now put into their rightful heavenly perspective. They are released; given back to God; for to hold on to them is to kill the future God hopes for us...and so, ultimately, to bring about our own end (eaten by worms, we too become excrement). Only when we see God’s gifts and our achievements in response to God’s gifts not as ends in themselves but as part of something bigger can we experience freedom from the comparison game. Only then can we move from success to significance, to lasting legacy. To living fruitful lives. But this necessary shift is birthed through pain and loss. We see this time and again in Scripture, in the lives of those who respond to God’s call. Here is another waste-product illustration, from a friend of mine, Paul Maconochie. God gives us breath, as gift. That breath allows us to live and move, to be and to do. But we must breathe out – expelling water vapour and carbon dioxide – in order to receive our next breath. That utilising and then releasing what we were given is necessary, if we are to keep receiving from God. This is true at both a personal and a corporate level. 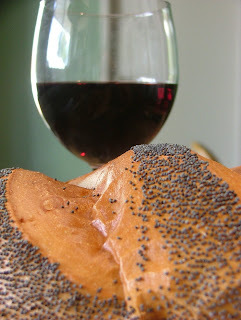 Those things by which God has nurtured and nourished us come to their natural end: what was good food becomes excrement. Excrement needs to be dealt with; and fresh food needs to be taken in. To hold on to past food – to make it an end in itself; to turn an icon into an idol – is to become spiritually constipated, passing through bloated discomfort to the death that results from the internal build-up of toxins. We naturally and rightly mourn the passing of what was good: but at times that mourning blinds us to the hope that God who has always been faithful will always be faithful, and keeps us from pressing on to take hold of that for which Christ has taken hold of us. We have not yet obtained all this. We must forget what is behind, keep moving forward, towards the goal, to win the prize for which God has called us heavenward in Christ Jesus. Are we willing to pay the cost? Have we given up? Do we need to reclaim that heavenly perspective? What do we need to purge from our corporate life? What fresh food do we need to eat? How can we encourage one another to press on? Film-maker Baz Luhrmann is a great story-teller. His 2008 epic Australia is a beautiful exploration of love and hatred both within and across tribes, both native and colonial. Like the narrator, a young boy with an Aboriginal mother and a European father, who feels he is neither black nor white – that is, does not belong to either community – there are no black and white categories here. Human relationships are far more complex than that. The backdrop of the War allows us to further explore race attitudes. The British/Australian belief that blackness could be bred out of mixed-race children, to their betterment, is the polar opposite of the contemporary German belief that blackness pollutes whiteness and must be wiped-out. But there is no moral superiority here: these are opposing sides of the coin, and the currency itself is morally bankrupt. In the end, there is only one race, the human race: composed of tribes, which form alliances and enmities; composed of families, constructed and reconfigured by unpredicted events; composed of complex, flawed, changing, redeemable persons. There are no black and white categories; but there are all the essential types, for this is – as all the best stories are – a fairytale. So we have the villain, a thoroughly nasty piece of work who meets a (necessary and satisfying) sticky end; the princess, who discovers that princesses have lot to learn about the world; the true king among men, who hides his heart, and must learn to share it; the failure, who is given the means of redemption at the very end of his life and so dies in peace; the wise sage, who guides and protects an innocent hero; the loyal friend, who lays down his life; the power-hungry over-lord, who must be thwarted before he ruins the land...In so many ways (not least the length) this is The Lord of the Rings set in our world – just as, in so many ways, The Lord of the Rings was the 1930s/40s set in another world. My five-year-old son has just taken on responsibility for feeding our kitten. This involves pouring dry cat-food from a fairly large bag into a fairly small bowl. For the time being, it also involves quite a lot of cat-food being spilled over the floor. Jesus took his disciples from unconscious incompetence (I do not know that God can work through me), through conscious incompetence (I lack confidence that God can work through me) and conscious competence (I am growing in confidence that God can work through me), to unconscious competence (I am confident that God can work through me). In the initial stages, delegating responsibility for something we can do perfectly well ourselves always means additional work for us. Perhaps that is why so many over-stretched church leaders don’t hand responsibility on: they can’t face an additional short-term increase in demand on them, in order to secure a longer-term win – a re-defining of their role, and a releasing of others into new roles. And if we come to see raising people up as our primary responsibility, then what this demands of us will not be additional work, but simply our work. We may discover that other things we do are additional, and unnecessary or at least less important than we thought, and give them less of our time. What am I doing that someone else could do – perhaps better than me, given time? What am I doing that I can train someone else in and give away? and opposition, up to and including persecution. Moreover, these predictive assumptions are seen to have been borne out in the life of the early church, as communities of faith struggled to live faithfully (and let us not pretend that it was not a struggle). In the UK church today, we have largely divorced faithfulness from any consequence. This is not to say that faith does not give birth to events – it clearly does, in many churches across the nation who are engaging with the wider communities in which they are set – but that it is possible, and indeed commonplace, to imagine a faithfulness which does not. We believe faithfulness to exist as a thing unto itself. As such, the measure of faithfulness is not empirical, but defined by our own belief that we are faithful Christians. If our lives do not bear fruit, that is because we live in a society that is apathetic towards the gospel. If our lives do not attract opposition and persecution, that is because we live in a society that is apathetic towards the gospel. And this may be true: but then, if apathy is the only response to the gospel, we must question the gospel being presented. And if we are faithful Christians – and I am sure that we are faithful Christians – we must ask the question of ourselves: is our faithfulness the kind of faithfulness Jesus expects, or not? Today is the Feast of St Matthew. We read about the day Jesus called this disciple to follow him, in Matthew 9:9-13. Matthew was a tax collector, who served Herod Antipas, the tetrarch of Galilee (Herod’s father, Herod the Great, had been installed as client king over Judea; but after his death his territory was divided between his heirs, none of whom were granted the title king). Herod’s tax centre was Capernaum, and therefore there were a community of tax collectors based there. Jesus comes to Matthew and calls him to stop serving a false king, and instead enter into the service of the true king. We know that Matthew sees Jesus as such because the Gospel that bears his name begins with a genealogy tracing Jesus as a descendent of King David, a rightful heir to his throne. The devout observers knew very well that Herod Antipas was not a true, Davidic, king. He was an imposter; and those who served him were unworthy. The irony was that, as those who knew Herod was a false king, they failed to recognise the true king standing in their midst. He did not match their expectation of a true king, befriending those who served a false king instead of condemning them, loving his enemies. Their own king was also false...in that they placed too great a weight on their incomplete image of God. God is Invisible. Yes, but now Revealed. God is Set Apart. Yes, but also moves in close, in Compassion. It wasn’t that they were wrong so much as they were sure that their partial understanding was greater than it was, and as such they weren’t open to it being expanded by paradox. Devout people haven’t changed. Rejoice in what you have been given, but don’t fall into the trap of turning gift into an idol. There is a cost, to leaving behind and following after. What false king do I need to leave behind today? Who, in my community, am I bringing along with me? Jesus has drawn his disciples deeper into the story of what it means to be fully human: to know that we are children of our loving heavenly Father, with everything that is his at our disposal; and to reign as kings and queens exercising power and authority delegated to us by the King of the Universe. He has taught them to use that power and authority to drive out unclean spirits, bringing freedom to the demonised, and sent them out (Mark 6:7) to do so. And they have. And then they come across a demon who defies them: not just a pair of them (Jesus sent his disciples out in pairs), but the combined presence of nine of them. It is a moment of very public failure. Jesus takes them away from the public glare, and brings them back, once again, to the story: they need to dig in to prayer, into intimacy with their Father; and they need to dig in to fasting, into exercising rule over, starting with their own appetites. But no sooner have they been brought back to the story than they go forgetting it. Hot on the heels of public failure, they get caught arguing over which of them is the greatest. And yet again, Jesus brings them back to the story: they are not chosen, are not special, because of what they have done, but because they are God’s beloved children; they have not been given power and authority to be served, but to serve – not to add to the slavery that burdens those around them, but to set people free. Jesus takes a child and stands with him in the middle of the circle, calling them to repent and believe. To come back to the story, and live it out. On Sunday I will be conducting a baptism: immersing a child into our story, that they might come to know and love the God who knows and loves them, and fight valiantly as a faithful soldier of Christ against everything that opposes heaven’s life-giving reign throughout all their days. The readings will be from Psalm 145:1-8, which reminds us that it is our duty and our joy to pass the story of what God has done and his purposes for his creation on to the next generation; and Mark 9:30-37, which reminds us that we easily forget our story – are regularly tempted to exchange it for a lesser story, and so find ourselves enslaved, by fear or greed – and need those to whom we pass it on to remind us of it. Together, they describe a beautiful inter-dependent relationship, the heart of family as God hopes and dreams for it to be. Richard Dawkins is publishing a book for children, to help debunk ignorant creation myths and replace them with the far grander truth of science. Yet again, Dawkins’ argument is breathtaking in its lack of self- and other-awareness. For a start, Genesis chapter 1 is not a creation myth; it is a redemption myth, or story that transcends the time-and-place context in which it was first told. Obviously, from Dawkins’ perspective, perpetuating a redemption myth is as stupid and ignorant as perpetuating a creation myth; but nonetheless he demonstrates his own lack of awareness of what he is looking at, as much as the lack of awareness demonstrated by many of his critics. True fundamentalist that he is, Dawkins also fails to accept that we all pass on to our children the stories by which we find our identity, the identity in which we find our security, the security which allows us to live confidently in a big and wonderful and at times deeply troubling and uncontrollable world. The stories of science are also myths (stories that transcend the time-and-place context in which they were first told). Of course Dawkins believes that his myth is the true myth, just as passionately as I believe that the myth I believe is the true myth. But this passion does not in itself make either of us right. Nor is his myth any less self-referential. For Dawkins, “You don’t believe that, do you?” is an adequate response to questioning: the self-evident measure of truth being whether or not we believe something to be true. At any rate, arguments about the truth of myths also miss the point, in that all myths are selective in their concern. For example, the writers of the Bible take it as a given that God created the heavens and the earth, but are not concerned with how he did so, and in this sense the biblical myth has no interest in the things that science addresses. Likewise, the myth of science does not concern itself with a great many matters, which neither invalidates those things, nor invalidate science. Dawkins is entitled to his myth, and I am entitled to mine. As they are the stories by which we navigate life, it would be both irresponsible and in fact impossible for us not to pass the story we inhabit on to our children. They are, in a very real sense, immersed in those stories from birth, from before they can take them in. And children do not take anything in unquestioningly, but ask the most profound questions of any myth – questions far more profound than any adult ever asks – and in this way they challenge us to take hold of our myth more fully, or loosen our grip on it on the way to searching out a new story. Adults, religious or atheist, do not brainwash children; each, as much as the other, passes on what we believe, and in turn has what we believe renewed by our children’s response. So Dawkins will go on telling his story, and I will go on telling mine. We cannot do otherwise: it is what makes us, by incredible chance or incredible divine purpose, human. At the same time, there are a great many community projects, some delivering frontline support services to the most vulnerable people in our communities, which depend on volunteers and are struggling to deliver because they cannot fill the necessary volunteer hours. If you live in the UK, you can find opportunities local to you here (with thanks to my wife for finding this site). Why don’t churches ask the question, “What community service can we adopt, or partner with?” more often? I think there are a number of factors. Firstly, I honestly believe that many of us have somehow come to believe that if we don’t do the work in our name, it can’t be done in God’s name. Perhaps, even, if we don’t get the glory, God won’t get the glory. That we are patrons, rather than servants; that we are at the centre, rather than the margins; the powerful, rather than those who call the powerful to use their influence for justice and not injustice. Secondly, I think there is a genuine fear that if we don’t operate in our own name, we won’t be allowed to speak of Jesus, or we will be on the receiving end of disciplinary action if we do. Such fear needs unpacking. There is the disciplinary action which results from prejudice in the name of Jesus, and it may be that God is perfectly capable of using the law of the land to discipline (train, correct) his own children. Then there is prejudice against Christianity, which quite frankly needs to be stood up to: who are we, as sons and daughters of the King, to avoid a bully, when the perfect love of our heavenly Father drives out fear? We may need to learn to serve others because in so doing we are serving Jesus, and trusting God to give us opportunity to speak of him when asked by a Person of Peace. We also need to learn to be served by a Person of Peace, in whom we see – if we have eyes to see – Jesus serving us, as opposed to thinking that we have the monopoly on servant-hearted witness to the heart of God the Father as revealed by Jesus. Thirdly, many of us have buildings the existence of which cannot be justified by worship services alone. We want our buildings to be used through the week – and that may well be appropriate. Sometimes we can meet a genuine need that way. Sometimes we could offer our premises as a base for someone else to operate from, in partnership with us. And yes, several churches have run into difficulty in this area (in particular where church halls have been opened to community management in such a way that has led to the congregation being excluded from use of their own building; though this is likely the result of poor legal advice at the outset), which should give rise to wisdom, but not a retreat into unilateralism. Where we have small congregations burdened with the repair of old edifices, we might do better to sell the building. 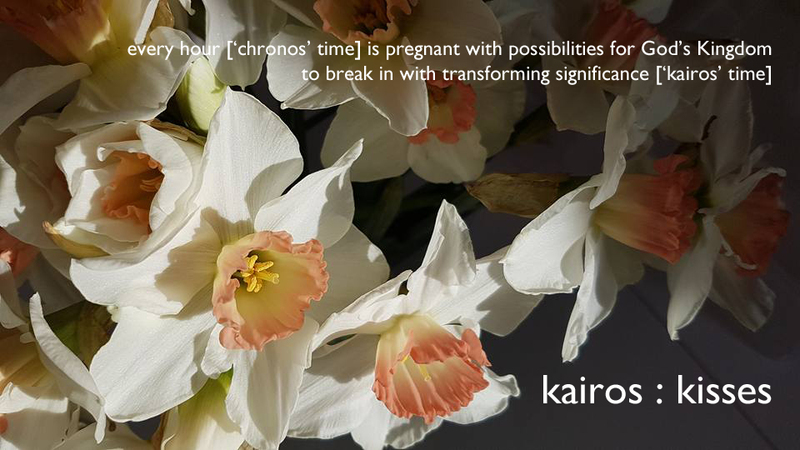 Where, at present, our volunteer hours are consumed by the church – in hope of drawing people in – we might consider looking outward to the community, as a way of releasing transformation in a light-weight and low-maintenance and therefore sustainable way. Where, at present, individual members of the church might give external volunteer hours in isolation, we might consider committing to a particular project as a group big enough to make a difference. Does this resonate at all? Does anyone have stories to share of how the OUT-ward dimension of their faith community’s life has found expression by becoming more fully members of the wider community in which God has placed you? Jonathan Sacks has also written one of the most insightful reflections on 9/11, here. The greatest moral failing of church leaders in the UK is their refusal to rest. Are we really more indispensible than God? The problem is endemic. If it were thought to be endemic that church leaders were shagging their neighbour’s wife/husband, or embezzling the collection, there would be an insistence, by both clergy and laity, that things needed to be addressed. But the endemic state of restlessness is accepted as a given; and even (and especially by bishops) held up as a virtue. Don’t wait until you have gathered a critical mass of people who will follow before turning to raising up leaders. Critical masses will be, well, critical. Those equipped to be leaders will go looking for followers. This is the good news: you were created to know that you are a son or daughter of your heavenly Father; and to exercise life-affirming rule as a king or queen in this world, delegated to you by the King of the Universe. If you don’t recognise that, if that is not your experience, you need to be set free. Perhaps you have never known freedom; or perhaps you have known freedom in the past, but somewhere along the line you have been taken captive – by fear, or hurt, or jealousy, or the false promises of wealth or importance – and have forgotten who you were created to be, what you were created for. To a greater or lesser degree, every one of us needs to be set free, again and again: this is not an in/out divide. Again and again the Bible records how God comes to set people free – from slavery in Egypt, from idolatry in Israel, from exile in Babylon, from impending destruction by Rome (that Prophet was thrown out of the city and killed) – and restore them to their rightful place in his vision for the world. And the ultimate expression of this coming and setting people free, to set others free, is found in the person of Jesus. This is our story: the story in which we find our identity: the identity in which we find security, in an uncertain world: the security which enables us to live confidently, in uncertain times. You may have heard other accounts. That the Gospel is about forgiveness, perhaps. The Gospel includes forgiveness (it is a key by which we are set free, by which we set others free); but a Gospel of forgiveness is at best incomplete – we are not only set free from slavery, but set free for sonship and kingship – and at worst a gospel of sin-management rather than transformation. Or perhaps you were told that the Gospel is an invitation into heaven. And it is, but not as an other-worldly other-timely promise: it is the invitation and challenge to step-into the kingdom of heaven – the sphere of God’s reign – in this world today, and to extend it, driving back all rival claims, and inviting/challenging others to do the same. It is about time we rediscovered the Good News. Fairytales are the highest form of allegory of the Christian life to emerge within Christendom. * I wonder what the highest form of allegory of the Christian life to emerge within post-Christendom will be? *Consider Rapunzel, as an allegory of Christ and humanity. A beautiful princess is held captive by a wicked witch, who tricked her parents into handing her over. A prince comes to rescue her; and woos her for her love. But the witch pushes him from the tower window; he falls to the ground, where his eyes are blinded by the thorns. He then re-climbs the tower, and his sight is healed when the princess’ tears fall on his face. The witch is over-thrown, and the prince and princess go off together. And here, fairytales traditionally gloss a premature Ending, with the phrase “And they lived happily ever after.” Of course, what follows is not an empty life of leisure (and perhaps it was such a life modelled by princes and princesses which gave rise to the gloss), but the day-to-day life of ruling over the kingdom in such a way that goodness continues to triumph over evil. Because the princess is set free to be a princess: one who shares in reigning. Consider Beauty & the Beast, as an allegory of Christ and humanity. A handsome prince is held captive by a curse which mars his nature, until such time as someone freely falls in love with him as he has become. Despite his own efforts to hide from the world, a vulnerable girl meets him and, at great cost to herself – for in choosing him she will lose the life she has always known – comes to love him. Her kiss breaks the spell; his true nature and identity is revealed; he returns to claim his rightful throne, and she shares the rule of the kingdom with him. Consider Cinderella or Sleeping Beauty or – just go consider the fairytale; the highest form of allegory of the Christian life to emerge within Christendom. We were created to rule; and Christ came to set us free to take up the rule which had been taken from us. My bishop has asked the churches he has oversight of to address three questions, one of which is “How can we grow numerically?” He has also given a clue to where they might look, that this question is one of leadership. I have no doubt that we need to look at the form and content of our corporate worship services; to ask whether they might be more accessible; to ensure that they acknowledge a range of personalities (the diversity with which God has created us), and spiritualities (the diversity with which God has shared insights into his nature among his people) – while also recognising that no one local church can or should attempt to reflect these diversities too fully. I have no doubt that we must continually negotiate the balance between upholding tradition (the antidote to the arrogance which thinks we supersede what has gone before) and letting-go of tradition (the antidote to the arrogance which thinks we have already arrived at perfection); and in this way live in the creative tension of imbalance within necessary parameters, by which life can give birth to life. But these things in themselves will not result in numerical growth. We need to raise up leaders, equip people to invite others to follow them. We need to make disciples, who can make disciples, who can make disciples. We need to teach people to do the things Jesus did – ushering-in the kingdom of God, breaking-out against the kingdom of the usurper-prince of this world – for the reasons Jesus did those things – to set the sons and daughters of our Father in Heaven free to take up their vocation to be kings and queens of this world under the King of the Universe, to his eternal glory, in which we get to share. The other day I attended an event aimed at helping people – in particular, though not exclusively, those at school – explore their Christian vocation; an event which confirmed for me my belief that we are coming up with creative new answers to old questions, when in fact we need to come up with new questions. There were, as I noted above, a diverse set of answers to an old question, answers which have been adapted (more, or less, successfully) for a new context. The question is, in essence: how do we validate vocation, and create ways for it to be expressed? But behind the question lies an assumption: the assumption that vocation refers to a particular type of calling, a calling to serve within particular roles – the clergy, the missionary, the church worker – a calling that applies to the few. And on the basis of that assumption, we deny (whether we intend to or not) the calling of everyone else, and we compete for the Chosen, and we push anyone who expresses a seriousness about following Christ into a very narrow mould which removes them from the places where those who most need them live out their lives. We might even suggest that they serve a gap-year – national service for the kingdom of heaven – before (or after – after all, we’re being creative) getting on with a career. What we need are new questions, based on a different assumption: on the assumption that everyone has a vocation – that each one of us has been made by God to be a unique someone and to do particular things as well as things common to others. That we are all called, and need to learn to discern our calling in the world. As I see it, my calling is to a large degree to help other people to discover and grow in their calling. What subjects do you enjoy engaging with? What are you naturally good at? Which teachers engaged and inspired you (were a Person of Peace to you)? God does ask us to do things we don’t want to do, in order to help us grow to maturity; in order that we do not end up spoilt brats, lacking the strength of character to stand up to hardship. But God does not go looking in the recesses of your mind to find the thing you most fear he might ask you to do, the thing that goes against how he made you, and decide to make you do that. God is not a monster. But if that is what you believe, please do me a favour: please don’t talk to anyone about God. Ever. (ii) Jesus re-members his broken body (and so brings the future into the present), a body broken not only by the sin that separates us but also by such things as geographical and temporal and cultural distance, which are not at all sinister in themselves but which potentially create room in which sin can be nurtured. This is the pattern for all Christian remembering: we choose to bring the past into the present, not in order to keep old wounds fresh, but in order that broken or divided communities may be put together – in order that reconciliation can take place and healing can flow – and in this task we need to welcome a mediator, a minister of reconciliation. There is no point in recalling the events of 9/11 – or any of the global events that have taken place since – unless we are also willing to embrace reconciliation. But we must also be honest enough to recognise that reconciliation is hard – how, for example, might the wife and the mistress of a man who died on 9/11 be reconciled to one another in their shared, albeit complex, loss? – and that we need someone else to help us...just as we, in turn, might have to be the minister of reconciliation for someone else. At the tenth anniversary of 9/11 we ought to ask, how long must we go on remembering something so awful? The Christian answer is not “Forever: we must never forget!” (for such a memory resists its healing) but “Until the last person divided from their neighbour by this event has been restored to the human family.” That will take a long time, but it should not take forever. *Eucharist derives from the Greek for ‘to give thanks’ and anchors the act of remembrance in Jesus’ choice, in the face of death, to give thanks for God’s provision of the daily ‘stuff’ of life, and to honour it with the gift of pointing to life that overcomes death. This post is a technical one, relating to nurturing missional communities, both inside and outside of inherited church structures. I’ve been thinking about two different kinds of communities of faith, and how they work together. One is a community which is selected, where everyone is welcomed in, to whatever degree they are able to participate. The technical term for such a community is ‘modal.’ The other is a community which is selecting, where few are invited to join, and a high level of commitment is expected. The technical term for such a community is ‘sodal.’ A classic example of a modal community would be the parish church, which exists for anyone who lives within the parish, and ought to welcome anyone who wishes to join in. (This is particularly true in rural areas; in urban areas the proximity of churches and the presence of greater transport options have allowed parish churches to be less modal, along lines of Christian consumerism.) A classic example of a sodal community would be the convent or monastery, which are particular ‘set-aside’ communities, or theological colleges. Both modal and sodal communities are necessary: but each one loses sight of its purpose where it loses connection to the other. So nuns and monks serve those who will never become nuns or monks; while new nuns and monks – or indeed those called to any vocation (religious or otherwise) – begin to discover their calling within parish church communities. 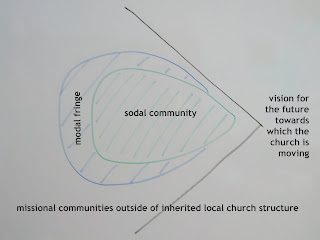 Where missional communities are pioneered outside of inherited church structures, they tend to be predominantly sodal. Members of the MC share a particular mission focus, to which they are highly committed. If they were to attract too many people who did not share their vision and values, they would be in danger of dilution and dissipation. As they engage with outsiders, it might reasonably be assumed that a majority of those who are drawn into the life of the community will come to share the common vision and values. 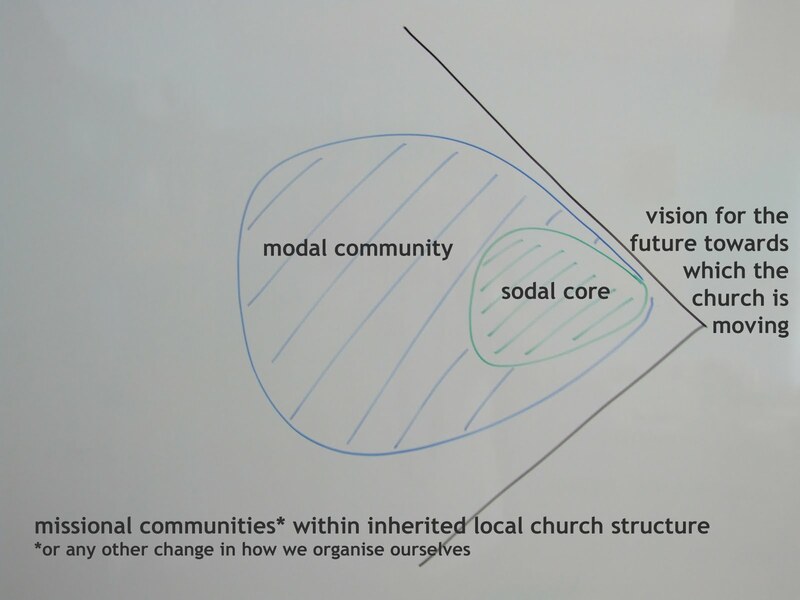 But this sodal community needs to have a modal fringe [see diagram], a place of transition where people can work out for themselves whether this is the community for them or not. 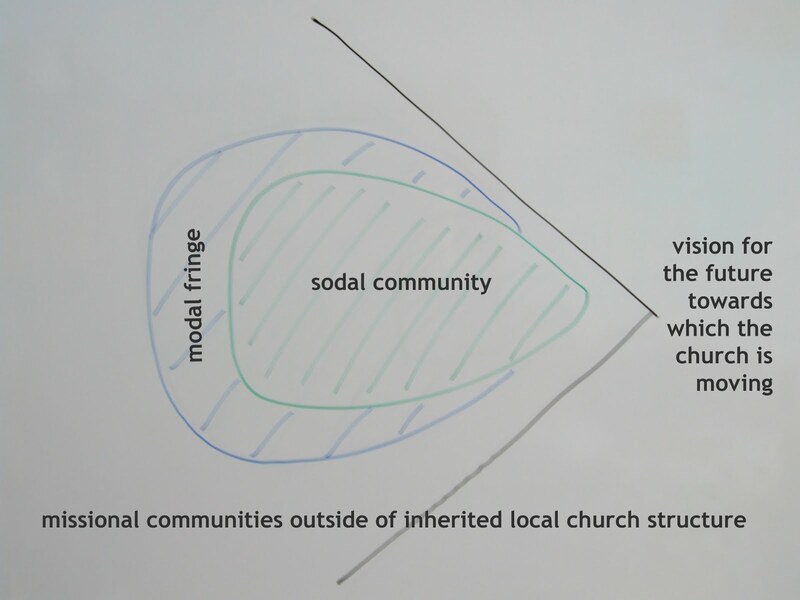 Where missional communities are introduced inside the structures of inherited church, a different approach is needed. 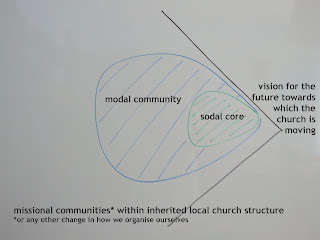 Rather than a sodal community with a modal fringe, here we are talking about a modal community with a sodal core [see diagram]. One of the classic traps church leaders fall into, in introducing any new way of being church, is to measure success in terms of take-up – and to measure ‘rebellion’ in terms of lack of take-up. This bears such fruit as driven-ness on the part of the leader and those who support the vision; and resentment – on both sides, the leader resenting those who don’t follow, and those who don’t want to follow resenting being pushed, or ignored. And there is much scope for such bad fruit, given that where a new way of being church is introduced (e.g. “We are a cell church”), take-up generally peaks at about 30%, with 50% being exceptional. thus allowing leadership to be renewed, rather than assumed, within the community. As leaders, we also need to die to success: if we believe that God is calling us to lead in a new direction – and if this is weighed by those who share the oversight of the community and they confirm our sense of calling – then it is our obedience rather than our success (how many go with us) that matters. Where we were on holiday. September, the start of a new academic year, the start of a new season, is a good time to ‘reboot’ or recalibrate life if you live in the northern hemisphere. Here are some rebooting questions. (a+b) calling – sharing in Jesus’ calling and ongoing mission, both in a general sense (e.g. sharing in his suffering and in his glory) and in a particular sense (e.g. as an apostle, prophet, evangelist, pastor or teacher). Q: In what ways have I become more Christ-like in the past twelve months? Jesus says that life lived well involves loving God, loving our self (by which, culturally, he meant ourselves as described not introspectively or self-centredly but in relation to those we are in relationship with: i.e. not only ‘me’ but my family, my faith community), and loving our neighbour (by which he meant members of the wider community, who are not part of our family/faith community, who live alongside us) as much as we love ourselves. (if you live with others) for us as a family? for us as a local expression of the church? Q: If love is a choice – as opposed to something we have no say over – in what ways might we choose to grow our love of God, self, and neighbour over the next twelve months?